June | 2016 | ride. travel. live. I don’t recommend just a long weekend visiting South America, but I’m pretty short on vacation days. 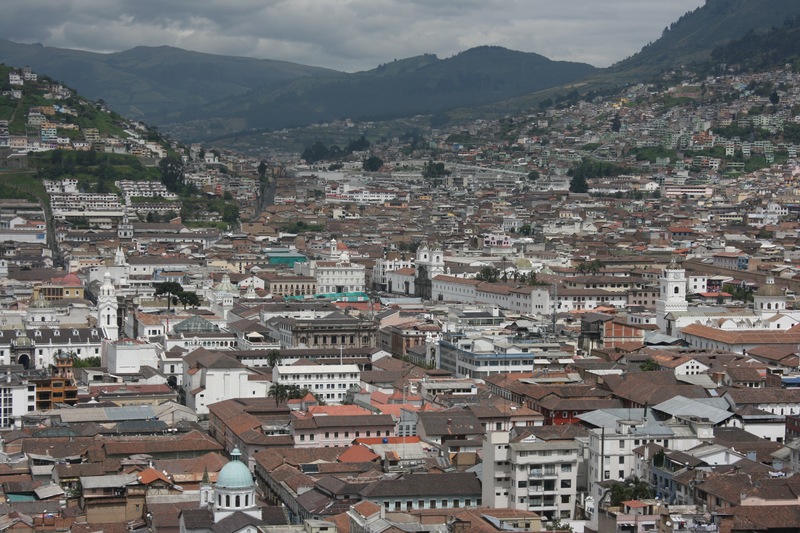 So I jumped on a cheap-ish fare, and flew to the high altitude capital of Ecuador, Quito, or more accurately San Francisco de Quito. I’m no longer used to long flights, and being squeezed into the back of a plane, on American Airlines, with a plane full of high schoolers, is tough to tolerate. In any case, the plane was delayed by a swarm of bees bugging the baggage handlers, and I didn’t arrive at my hotel until 1 AM, rather irritated. It’s a very new airport, but situated a very long distance, and a $26 taxi ride, from the city center where I stayed. Stepping off a plane in a foreign country is always a thrill, as your senses are heightened, and you notice nearly everything regardless of how tired and disoriented you are. I noticed the cool mountain air, at 2850 m, the city never gets that hot, and it’s always sweater or light jacket weather in the evenings. The ride went along a very new, modern freeway, past the usual commercial zones resembling anywhere in the US, first heading south, then turning west and curving around several canyons and heading nearly 2000 feet uphill to the city. I was finally oriented by the lighted statue of Panecillo towering over the old town, and sighted the whitewashed and slightly run-down structures of the city center. The very hilly terrain was reminiscent of the other San Francisco (California), just add nearly 3000 m and a lot of mountains. I essentially had two days to explore, and spent the first day walking and exercising hard just going up and down the steep streets and stairways. 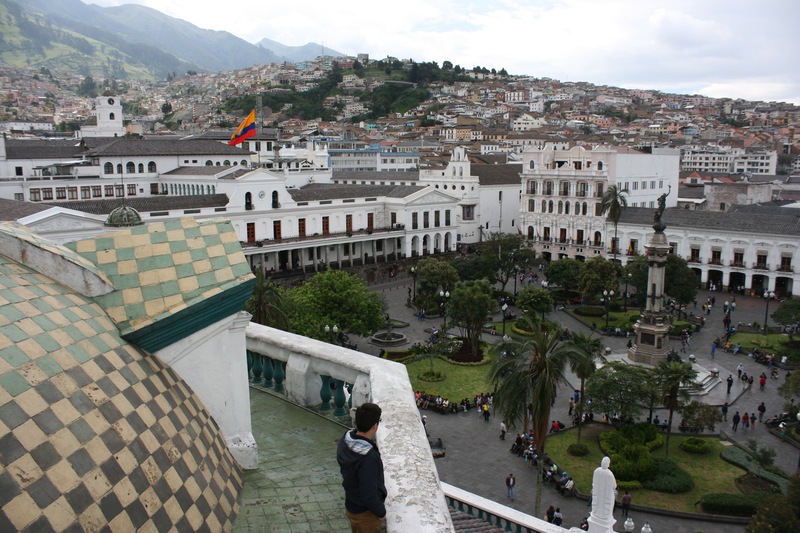 Ecuador is a very convenient country to visit for people from the US; the US dollar is the official currency, and it’s easy to track how much you’re spending. As for the prices, I found it to be slightly more expensive than Mexico City, for food at least. Lunches ran about $4-6 for the set course meals (almuerzos), museums were about $2, and of course, walking around was free. It’s still loud, noisy, and full of commercial activity, but easily an order of magnitude less chaotic than Mexico City. The city center is compact, situated on a grid, and definitely human scale. 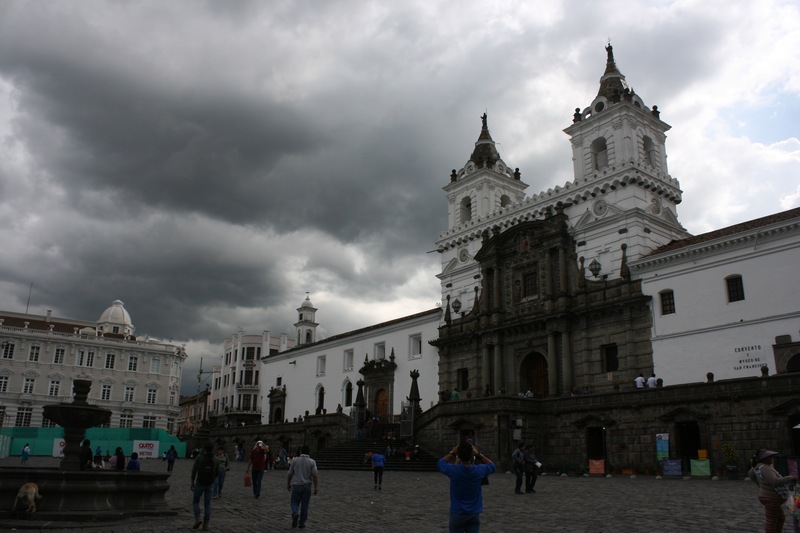 The population must be in fantastic physical shape, climbing all those hills and mountains at nearly 3000 m.
UNESCO recognized Quito’s old town as one of the first cultural World Heritage Sites in 1978, along with Krakow. To this day, it’s almost completely intact despite numerous earthquakes, and architecturally homogeneous. The churches are some of the most magnificent I’ve seen, with very fancy gilded interiors reminiscent of the Baroque churches in Rome, but with lots of Spanish / Moroccan / Islamic elements and designs. The style is unique. The exteriors are generally severe and solid, probably reflecting the seismic powderkeg of the surrounding region, but the courtyards are peaceful, lush zones away from the noise of the city. Another highlight was exploring the roof of the cathedral, which involved a very tight squeeze up a claustrophobic spiral stairway, and ended with a great view of the tiled domes and the plaza down below. The bad news is that many of the churches will charge you money to enter, so it’s easy to burn through cash here. Speaking of mountains, I headed up the Teleferiqo on Sunday (a $5-7 taxi ride from the old town). This cable car goes up the side of Pichincha, to 3935 m. I got up early and hunted around for an honest taxi (the ones with a camera in the front seat), and ended up walking nearly a mile before getting into one. The taxi circled around the southern traffic belt, through several tunnels, and climbed steeply uphill to the lower cable car station. The weather was cooperating, even though the weather forecast said it would start raining at 10 AM. But well, the forecasts are always generally right, and usually wrong on the details. I lucked out, but wasted no time in starting hiking once at the top station. My goal was the summit of Rucu Pichincha, which was a moderately strenuous, 3 mile (5.8 km) hike that topped out at an incredible 15380′ (4690 m). The elevation gain was just short of 2500′, and the trail was busy on this beautiful Sunday morning. Most of it was a regular hiking trail / dirt road, then a trail with a few scrambling spots and washed out areas, then a scramble up a loose sandy slope, turning into a Class 3 climb for the last 50 m or so. Nice and spicy, and hey, I’ve never been at this altitude before. But I didn’t really feel it, maybe it was the slightly thicker air from being near the equator, but it felt more like the equivalent of 13000′ in Colorado. I felt surprisingly good at the top, and the view was fantastic with all the civilization sprawling below and crawling up the sides of the Andes foothills. 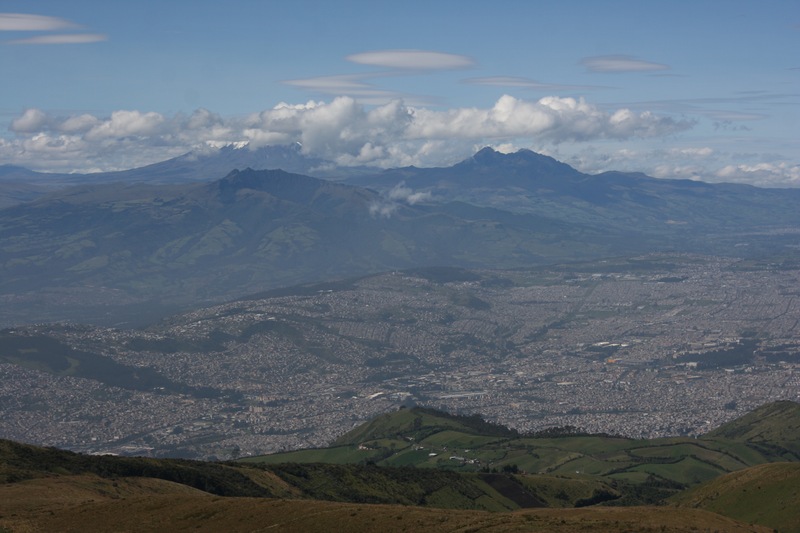 The bonus was the view of the nearby volcanoes slowly being enveloped by clouds, Cotopaxi’s symmetric cone, the broken summits of Iliniza Norte and Iliniza Sur just to the southeast, and Antisana, and Cayambe to the northeast. These peaks break the 5000 m mark, and being nearly that high, I had to believe that I could probably physically handle that little extra altitude. Exciting. By the time I got back to the cable car station, the summit was completely socked in with plenty of rain. The city is not known for sunny weather, and more often than not, it’s four seasons every day. 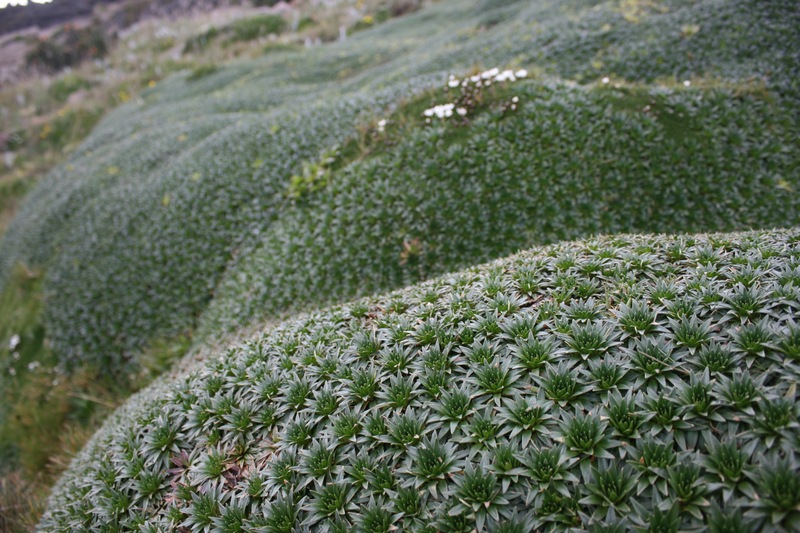 The other nifty thing was the vegetation, and there was plenty of it even at 15000′. The snow line doesn’t really start until around 16000′, compared with a 12000′ treeline in Colorado, and 6000′ at Mt. Hood. 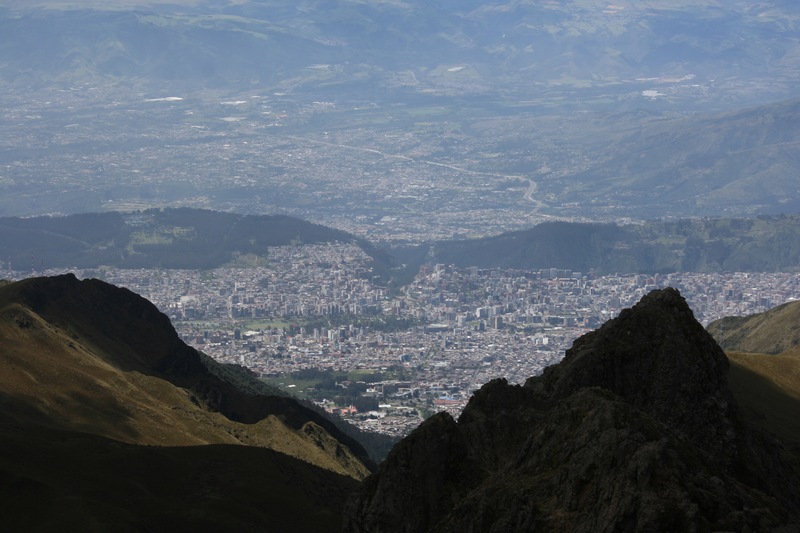 Every ecological zone is represented in Ecuador, with 20000′ of elevation difference in a country the size of Nevada. It’s amazing biodiversity. But alas, I had to catch the red eye back to the States and be at work in the morning. I definitely wasn’t looking forward to that, but what a fun little trip!